The 2012 Neo is a performance free ride kite that combines elements of the Evo, like smooth and predictable power development, with the simplicity of three struts into a stylish all-round package. The Neo’s short, round shape and pivotal turning makes it the perfect tool for tight, compact kite-loops. The reduced weight of three struts allows for comfortable “drifting” in the waves and provides excellent park and ride surfing. The Neo can be ridden on 4 or 5 lines and is an ideal kite for riders with a keen eye on simplicity and ease of use. Super durable and made with our highest quality materials and construction methods, the Neo is built to last. 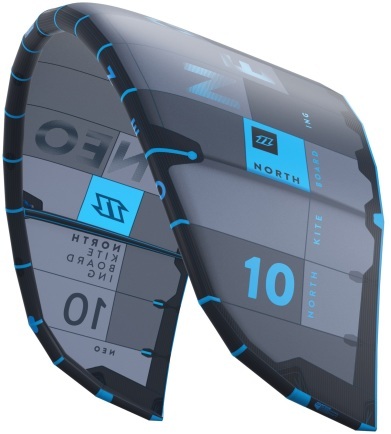 The 2012 Neo is a performance freeride kite that combines elements of the Evo, like smooth and predictable power development, with the simplicity of three struts into a stylish all-round package. We have put the North Neo and Evo side by side. To be honest, it quickly became pretty obvious to us that the Evo has seen more evolution cycles. What we missed the most in the Neo is a well balanced character. 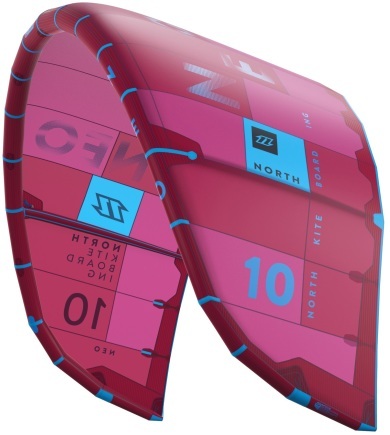 Both kites find themselves in the freeride/wave spectrum, in which turning speed, feedback, drift and depower should be considered important characteristics. Both kites turn fast (center turn). The Neo is a little more restless on the bar and in its power buildup, but in return it delivers more pop and boost. The Evo has a Delta shape and lies somewhat deeper in the wind window, whereas the Neo has a bridled C-shape. Suitable for whom? Lighter wave/freeride performers who are looking for speed en explosiveness in their kite. Tip: test the Neo before buying, since it has a very specific character.